Crimson Trace LG-903 LG-903 Maser Series Rosewood 1911 Bobtail Laser Grips FREE SHIPPING! 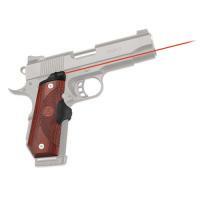 Enhance the classic 1911 by adding a laser to your defensive capabilities. These beautiful rosewood lasergrips from Crimson Trace fit the 1911 Bobtail and are fully compatible with ambidextrous safeties due to a smaller laser diode housing. Both aesthetically pleasing and ergonomic, these comfortable rosewood side panels put out a powerful red laser on the target. The LG-903 Master Series Laser Grips can be activated by your natural firing grip via the Crimson Trace's Instinctive Activation™. The activation pad is strategically placed right in front of the grips below the trigger guard and is made of a rubber overmolded material. Powered by two #2025 batteries, this powerful sight can run over four hours. The Crimson Trace rosewood lasergrips are sure to impress! Fits 1911 bobtail style with grip screws measuring 3-1/16" apart. ©2002-2019 CopsPlus.com: Crimson Trace LG-903 LG-903 Maser Series Rosewood 1911 Bobtail Laser Grips FREE SHIPPING!